The Unity are a power metal band from Germany formed in 2016 by former members of Love,Might,Kill Jogi Sweers (bass player), Stefan Ellerhorst (guitar player), Sascha Onnon (keyboard player) and Jan Manenti (singer), and current members of Gamma Ray Michael Ehre (drummer) and Henjo Richter (guitar player). This new band was named The Unity, and in 2017, the band released their self titled debut album. The bands second album, 'The Rise' was released in 2018. Germany, the birthplace of the power metal genre, carries a long tradition of producing great metal bands, beginning in the seventies with pioneering act Accept. Other bands such as Grave Digger, Helloween and Primal Fear are leaders in the power metal genre, with many new bands forming to carry the torch of power metal into the future. The Unity are one such band. Six experienced musicians coming together can only mean one thing...brilliance! With their sophomore album, The Unity build on their achievements of last year (with their self titled debut), and re-inforce their position as a leading power metal band. 'Revenge' is a one minute, atmospheric intro to the bands new album, launching forth with the lively 'Last Betrayal'. Foraging, fiery and furious, 'Last Betrayal' is fast paced "foot on the monitor" style heavy metal with a massive melodic edge. A catchy and sing a long style chorus adds weight to the breath taking opening salvo. Hard rocking and heavy hitting, 'You Got Me Wrong' whips up a storm as it boldly marches on. The opening double shot by The Unity is exciting, attractive and bloody damn infectious. Second single off the album, 'The Storm' is a bombastic barn stormer. The album clocks in at almost one hour in length, with thirteen songs on offer. 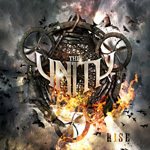 The Unity offer melodic power metal in abundance, with every song one hundred percent infectious, with catchy and sing a long style choruses everywhere. Heavying things up a little, 'Road To Nowhere' lurches forward with punchy riffs and a thunderous rhythm. Adept at all variations of power metal, The Unity are delivering a devastating metal avalanche. Pace quickens with the blistering 'Welcome Home'. Moving the album towards the pace of the opening song, 'Welcome Home' romps along like a race horse galloping for the finish line. 'All That Is Real' is one of the heaviest hitters the album has to offer. Melodic meets hard rock meets anthemic, 'All That Is Real' stands astride the epic and glory genres, hinting at the glory days of eighties hard rock. Hustle and bustle takes over the album as 'No Hero' majestically strides forward, displaying a slender hint at the progressive metal genre as it relentlessly chugs its way on. Any modern day power metal album is unlikely to run its course without a power ballad, 'Rise' falls into that category with 'The Willow Tree'. Displaying a much more mellow and sway from side to side vibe than anything heard so far, 'The Willow Tree' is filled with passion and emotion. Just make sure you have plenty of fuel in your lighters, as you hold them high from start to finish. 'Above Everything' brings bombast and energy back to the album in a mighty way. Stretching its legs, 'Above Everything' is foot tappingly and head noddingly addictive and is a monster riffing melodic march. Light the fuse and stand back as 'Children Of The Light' explodes into life and scorches the earth as it flies by in a furious flurry. The fastest song on offer, 'Children Of The Light' is a head bangers dream, and is one of my favourites on the album...although it is very difficult to choose just one as they are all bloody great songs. 'Better Day' is one of the best anthemic party styled heavy metal songs you're ever likely to hear. Big riffs, bigger rhythms and the most addictive sing a long style chorus on offer, 'Better Day' is a corker. Bringing the album to a close, is 'L.I.F.E. ', a hard rocking, hard rock party anthem that will leave listeners with a great big smile on their face. What a song, what an album. Overall, a majestic march of melodic power metal at its very best, The Unity have delivered a cracking album of infectious and catchy songs.